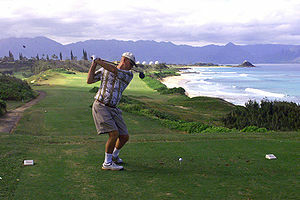 ﻿Golf is not only enjoyable for many people–it’s also intensely healthy. It provides sustained exercise for the body and focus to strengthen the mind, helps develop the muscles of the back and upper body, and—best of all—can still be played into your sixties, seventies, and even eighties in some cases. The trick to getting the most out of golf for your health is to walk the links. The United States Golf Association argues that golf can offer major health benefits, but that these are greatly diminished with the use of a golf cart. On the other hand, by walking all eighteen links, you will have the benefit of getting through several miles of good solid walking. However, since these miles are walked with leisure, and in between strokes, they will not feel like as much work. This makes golfing a very healthy addiction. By golfing every weekend—and walking the links—you can lose weight, improve your heart health, and develop an overall healthier stamina. Studies have shown that golfing burns calories. However, you will burn the most calories if you walk the links yourself, and even more if you carry your own bag rather than if you use a caddy. You could burn as many as 700 calories in a nine-hole course. If you find walking every hole to be a bit strenuous, get a cart and take turns walking every other hole with your golfing partner. You’ll still get a great work out! Don’t forget to drink plenty of water so that you stay hydrated and your muscles don’t begin to cramp up and get strained. Both the energetic use of long distance strokes and the long walking distances will benefit your cardiovascular health. Also, the more calories you burn every week, the lower your chances of developing heart problems later on in life. In fact, it is said that burning around 2,500 calories each week can heavily reduce your risk of developing heart problems. By playing just one eighteen hole course and carrying your own bag every week, you can get more than half way to this goal. Getting a workout outdoors is far more beneficial than working out in a gym, simply because this allows you to get access to the sunlight, and therefore your body’s own stores of vitamin D. And this means strong bones and healthy blood and skin. Of course, always wear proper protection against the sun, which usually entails an SPF of at least 30. What better way to get in shape and stay healthy into your later years than by playing a sport that is so easy to love and enjoy? Who is Brian Bujdos and Why Should We Listen to Him? Brian Bujdos is a professional writer with 15 years of experience in newspaper and magazine journalism, public relations and marketing. He is a former award-winning sports reporter, has worked for professional sports teams and also served as a public relations professional in the tourism industry for five years. His latest duties include serving as the lead contributor and editor of medical-related content for numerous websites. Brian is a native of Pittsburgh, Penn., a graduate of Syracuse University and a resident of Scottsdale, Ariz. He is a former staff writer for the Albuquerque Tribune, Phoenix Suns, and Arizona Diamondbacks. He has written freelance golf articles and course reviews for numerous publications. He professes to be familiar with every player who has a PGA Tour card, yet his swing resembles none of them. Brain works for the eDrugstore.MD writing team. They write and blogs hundreds of articles published online and in print, covering everything from sexual health to parenting to beauty, fashion, entertainment and more. eDrugstore.MD, provides safe medications online, prescribing medications such as Viagra, Cialis and Levitra.